Extended cuff and thick latex exam glove provides greater protection in high-risk situations. AllegroMedical.com presents The McKesson GUARDIAN EC Powder-Free Latex Exam Gloves. 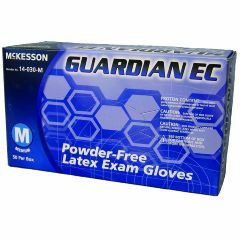 McKesson GUARDIAN EC Powder-Free Latex Exam Gloves - Medium. Extended cuff and thick latex exam glove provides greater protection in high-risk situations. Blue. Textured fingertips. Extended cuff. Beaded cuff. Non-Sterile. Ambidextrous. Single use only. CAUTION: Safe use of this glove by or on latex sensitized individuals has not been established. CAUTION: THIS PRODUCT CONTAINS NATURAL RUBBER LATEX WHICH MAY CAUSE ALLERGIC REACTIONS.